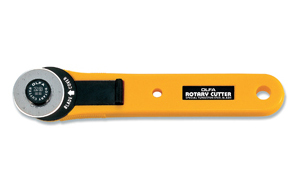 OLFA Rotary Cutter RTY-1/G Model 9551, a 28mm Rotary Cutter, the smallest of the Rotary Cutters, is great for small scale projects, minatures, and tight corners. This cutter features a blade safety cover and the handle is designed to reduce hand fatigue. The cutter is a rolling razor blade used to cut fabrics into shapes, strips, and pieces for sewing. Accommodates both right and left handed users. Perfect for general quilting, sewing, and craft projects. Can be used in industrial applications. Comes with 1 RB blade. Uses replacement blades RB only. OLFA Handles Are Guaranteed Forever. 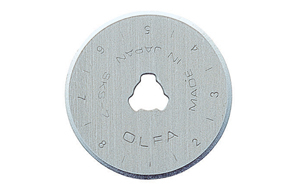 OLFA Blades RB28-2 Model 9561 Are 28mm Replacement Blades. 2 Blades Per Pack. CLICK ON IMAGE AND SCROLL DOWN TO RELATED PRODUCTS FOR A LIST OF CUTTERS OR KNIVES THESE BLADES WILL FIT. OLFA Blades RB28-5 Model 9459 Are 28mm Replacement Blades. 5 Blades Per Pack. CLICK ON IMAGE AND SCROLL DOWN TO RELATED PRODUCTS FOR A LIST OF CUTTERS OR KNIVES THESE BLADES WILL FIT. OLFA Blades RB28-10 Model 9563 Are 28mm Replacement Blades. 10 Blades Per Pack. CLICK ON IMAGE AND SCROLL DOWN TO RELATED PRODUCTS FOR A LIST OF CUTTERS OR KNIVES THESE BLADES WILL FIT.